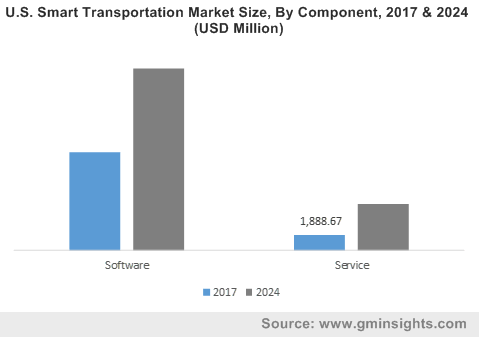 Smart Transportation Market size was estimated at over USD 41 billion in 2017, growing at a CAGR of over 20% from 2018 to 2024. Rapid urbanization, traffic congestion caused by crowded road network and collisions, poor traffic management, and lack of passenger safety are the major concerns faced by both developing and developed countries worldwide. The adoption of smart transportation solutions will help in curbing these issues by providing an efficient means of transportation, maintaining a smooth traffic flow, reducing traffic congestion, and enhancing public and environmental safety. The government initiatives for developing smart cities around the world are majorly contributing to the rising demand for smart solutions. Smart transportation combines different types of advanced communication and IT to form a network of intelligent transport systems, which assist in managing traffic and change the way users, businesses, and governments deal with the transport. The combined efforts taken by the government and citizens to reduce greenhouse emissions by developing hybrid vehicles and adopting substitute fuels such as CNG also offer great opportunities for the growth of smart transportation market globally. The huge capital required for replacing the existing infrastructure, long downtime, security issues concerned with big data storage, and immature market conditions in developing countries are the factors anticipated to restrain the intelligent transportation systems growth over the forecast period. Smart transportation solutions are increasingly being adopted to reduce traffic congestion and offer passenger safety and environmental protection. Roadways account for the highest market share in the market due to the growing number of road vehicles and the ease-of-transportation on a daily basis offered by these systems. Railways are growing at a fast rate over the forecast period as they offer benefits such as reduction in CO2 emissions, cheaper and faster mode of traveling, and continuous tracking of the trains through the connected railway systems. The upsurge in the demand for railways is due to the factors such as improved railway services, increasing use of IoT and government initiatives, and the emerging trend of smart cities. Airways are the most preferred mode of transportation for overseas traveling as it is the fastest mode of transportation. Airports worldwide have been investing in various smart technological solutions, improving air traffic management and reducing accidents and delays thereby improving the passenger experience. The traffic management system dominated the market in 2017 of the software segment of the smart transportation market. The market is growing due to large-scale adoption of the services offered such as route guidance system, smart signaling systems, video surveillance, and traditional signaling systems. These systems aid in the freight management and efficient tolling. The ticket management segment is anticipated to grow at the highest rate over the forecast period. These solutions integrate smart card ticketing, online ticketing, and mobile application ticketing and improve the customer service. They also provide facilities such as ticket booking flexibility and digital payments thereby reducing frauds, revenue losses, and maintenance costs, enhancing their demand in the market. Parking management is also an intelligent transport solution, which makes use of IoT and mobile payments to augment the parking experience. Smart parking assists in reducing traffic congestion and maximizes parking lot utilization, driving the market demand. The government and solution providers also act as key drivers by providing huge investments in the smart parking projects. For instance, smart parking was first initiated by the government in France by joining forces with leading service providers. 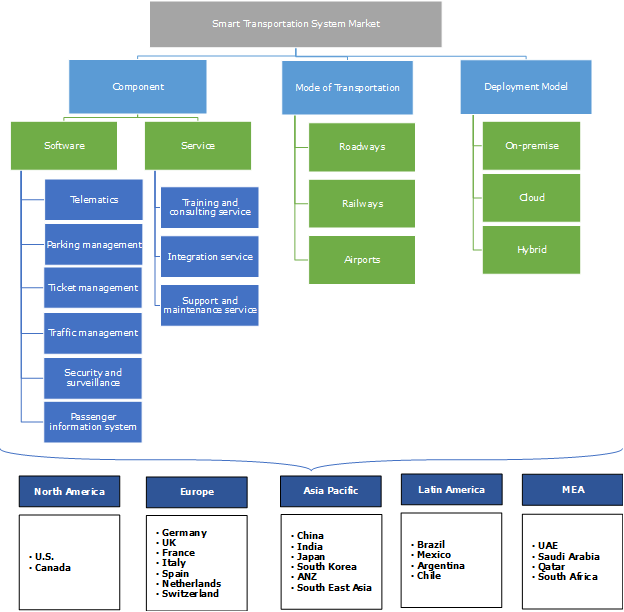 The integration service dominates the smart transportation market and is projected to hold the majority share over the forecast timeline. The increasing adoption of smart cities and IoT are the major factors accelerating the integration services growth. These services assist in upgrading the prevailing transport infrastructure and developing integrated parking, ticketing & traffic management solutions, leading to smooth traffic flow and reduced accidents. The training and consulting services are also growing at a fast pace owing to the consultancy and training services required for bringing about upgrades and technological advancements in the existing transport infrastructure. Cloud deployment model is anticipated to hold the highest market share over the forecast period due to the increasing demand for storing a large amount of vehicular data. Cloud computing solutions have a major impact on road safety and traffic management by using large vehicular resources such as internet and the storage for traffic-related decision making. The hybrid model will have the highest growth rate as most of the providers are planning to shift their focus from on-premise to hybrid model due to improved security and control over the data. North America holds the highest market share in the smart transportation market and is anticipated to reach USD 36 billion by 2024. The majority share is attributed due to the government investments in the smart city projects and the increasing demand for connected roadways, planes, and railways to enhance the communication with roads, ports, and rails, and improve the safety measures. Moreover, the real-time navigation facility and infotainment services enhanced the demand for market in North America. The majority of the smart transportation development in the U.S. mostly occurs at the local level. For instance, Los Angeles synchronized 4,500 smart traffic signals to enhance the traffic efficiency. This has resulted in a 16 percent faster flow of traffic across the streets. Asia Pacific market is expected to have the fastest growth over the forecast timeline due to due to huge investments by government and smart cities projects, especially in India and China. For instance, the Intelligent Transport System Association of China announced an investment of USD 30 billion in the intelligent transport industry by 2020. This investment will help them build electronic charging systems, encourage information sharing between cars, rails, buses, and civil aviation, and promote the green transport system. The companies operating in the smart transportation market are investing in research and development strategies aimed at new product developments. These products assist in improving the transport efficiency by providing traffic control, parking assistance, and management and electronic toll collection solutions. Some of the vendors in the market are Accenture PLC, Cisco Systems, Inc., Cubic Corporation, General Electric Company, IBM Corporation, Siemens AG, Thales Group, and WS Atkins. Some of the transportation system companies are engaging themselves in the acquisition of pure-providers for gaining the market share and for knowledge sharing. Smart transportation industry offers benefits to the automobile sector, software service providers, government sector, and public at large as they reduce the challenges faced by traditional transportation systems by allowing real-time analysis of traffic patterns, making smarter and safer use of transport systems. These systems have improved the traffic safety, energy efficiency, relieving traffic congestion, parking issues, and air pollution. The advancements in cloud computing and Internet of Things (IoT) are fundamentally transforming the transportation industry by automating the roadways, airways, waterways, and railway systems and providing a better user experience. These solutions are applicable to both public and private transportation and are critical to the economic growth of the country.